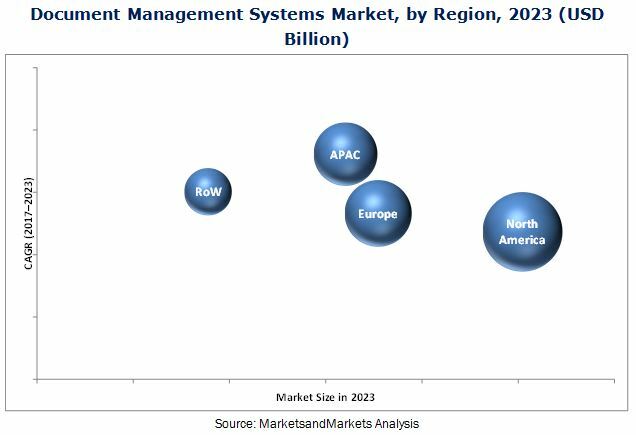 [159 Pages Report] The document management systems market is expected to reach USD 6.78 Billion by 2023 from USD 3.09 Billion in 2016, at a CAGR of 11.17% during the forecast period. The base year considered for the study is 2016 and the forecast period is between 2017 and 2023. This report provides valuable insights into the ecosystem of the document management systems market. The major players in this market include OpenText Corporation (Canada), Xerox Corporation (US), Canon Inc. (Japan), Ricoh Company Ltd. (Japan), IBM Corporation (US), eFileCabinet Inc. (US), SpringCM (US), Oracle Corporation (US), Alfresco Software Inc. (UK), and Hyland Software Inc. (US). The document management systems market is expected to reach USD 6.78 Billion by 2023 from USD 3.59 Billion in 2017, at a CAGR of 11.17% during the forecast period. Growth in this market is mainly driven by factors such as the increasing need to streamline business operations, benefits of digitalizing content across enterprises, and the increasing need to adhere to compliance requirements. In this report, the size of the document management systems market has been arrived at based on segments such as offerings, deployment mode, organization, applications, and regions. Depending on the organization, document management systems can be installed in both small and medium-sized enterprises (SMEs) as well as large enterprises. Based on deployment mode, the market is further segmented into on-premise, cloud-based, and hybrid models. On the basis of applications, the market is further classified into banking, financial services, and insurance (BFSI); government; healthcare; education; corporate; industrial manufacturing; retail; and other applications. The document management systems market, by offering, is segmented into solutions and services. The solutions segment is growing at a significant rate due to the increasing demand for document management, digital asset management, and eDiscovery by enterprises to achieve a strategic advantage and streamline their document management operations to minimize risks. The market has been segmented on the basis of deployment mode into on-premise, cloud-based, and hybrid deployment modes. The hybrid segment is estimated to be the fastest-growing segment of all the deployment models due to benefits such as better flexibility, technical control, enhanced security, and improved adherence to compliance requirements. The document management systems market has been segmented on the basis of organization into small and medium-sized enterprises (SMEs) and large enterprises. The market for SMEs is expected to grow at a higher rate. Growth in this segment is projected to be steady during the next 5 years, mainly because of the deployment of innovative technologies such as Social, Mobility, Analytics, and Cloud (SMAC) by new entrants in the market, which is compelling existing players to modernize their traditional IT infrastructures to meet changing customer requirements. Moreover, the market is segmented on the basis of application into BFSI, government, education, healthcare, corporate, industrial manufacturing, retail, and other applications. The BFSI segment is expected to hold the largest share of the market during the forecast period. Document management systems play a pivotal role in the BFSI sector in terms of gathering and managing all the financial data. These systems also provide enhanced data security and access controls in the event of cyber-attacks, bank robberies, and natural disasters. The deployment of document management systems in the BFSI sector ensures better accountability, risk management, operational management and end-to-end content governance, and better management among different functional departments. 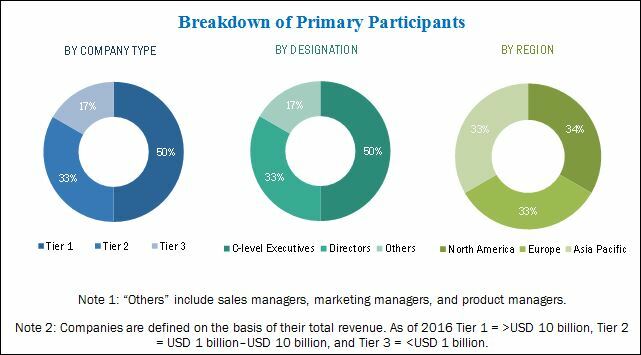 On the basis of geography, the document management systems market has been segmented into North America, Europe, Asia Pacific (APAC), and the Rest of the World (RoW). The market in APAC is expected to grow at the highest CAGR during the forecast period. Market growth can be attributed to several initiatives by the governments as well as private and public sectors in APAC. Moreover, the presence of major players in the document management systems ecosystem results in the increasing adoption of these systems in APAC. However, the high cost of implementation is a major restraint for the market. Key players in this market focus on inorganic strategies such as mergers and acquisitions to expand their business and related offerings. In January 2017, OpenText Corporation (Canada) acquired the enterprise content division of Dell EMC.